Nowadays, the flameless candles with timer take the market by storm. They present a convenient way to create that special ambiance and realism for a soothing and relaxing environment without any harms to the environment. More interestingly, one could now enjoy candlelight outside without worrying about the wind blowing them off. Now let’s take a look at our best flameless candles with timers 2019. 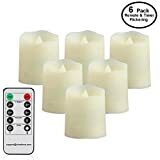 Flameless LED Tea Lights Candles with Remote - Votive Candles with Timer - Battery Operated Flickering Candles -Long Lasting Over 200 Hours - 6 Set x 1.8"
These Comenzar flameless candles with timer come in a beautiful package and inside, Styrofoam protects the candles. Included in the package are a compact remote control and a brief user manual. 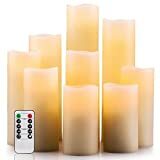 The compact remote control works for all candles, so you can choose to have them in one or more different rooms. However, you would need to carry the remote with you to each one. Its responsive timer works on a 24-hour cycle. If you set it today at 8 for four hours, it will stay on for the time, and go off. Tomorrow at 8, it comes back on for four hours, then off, making them very convenient. 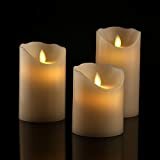 The Comenzar flameless candles with timer have a look and feel of real candles thanks to the outer wax coating on them. In the middle of the candle is where the flame is “lit.” They come in a set of six, indistinguishable from real candles. The Comenzar flameless candles are powered by three AAA batteries, with a battery compartment located conveniently at the bottom. They have two modes; one which the light flicker, and the other which they don’t. The LED Lytes best flameless timer candles are a family owned business run by two entrepreneurs. They use pure natural wax to give their candles that realistic look and feel. As a feature unseen in most models, LED Lytes allows you to set the flicker to your preference. They have a small profile, with a width of 2”. The six-pack measures 2”, 3”, 4’, 5”, 7” and 9”. More interestingly, the timer on the LED Lytes allows you to set them to run for long durations of up to 5 hours. Setting the switch at the bottom of the candle to “timer” automatically sets the timer to five hours, after which they will go off, and come back on 24 hours later. The LED Lytes flameless candles with timer are safe to use around children and pets and are just fantastic for weddings and other ceremonies. Nobody will be able to tell they aren’t real candles thanks to their dripping wax finish. 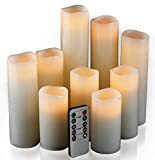 If you are looking for a somewhat large inexpensive flameless candles set then this is an excellent choice for you. They come wrapped in an elegant package, each individually wrapped in Styrofoam to prevent any damage during shipping. They feel genuine thanks to the wax exterior and flickering LED. At a glance, they can easily be mistaken for the real thing. When you decide to purchase Good Electonic Flameless Battery Operated Candles, you should be prepared to buy lots of batteries. They come in a set of nine, and each uses 2 AA batteries. On the bright side, these batteries are common and widely available. The remote features a battery and works even at long distances. These candles have a width of 2.2 inches. They would make a fantastic gift, and would fit well in birthday parties, weddings, or just as a simple tabletop. The package comes with a set of 5 candles: 4”, 5”, 6”, 7”, and 8”. Each of them has a diameter of 2.2”, and comes in an ivory color that matches most internal decors. Also included in the package is a user manual and a remote control that allows you to operate it from the comfort of your bed or sofa, as it has a range of 16.4 feet. The remote has ten keys and allows you to set the timer for 2, 4, 6, or 8 hours. 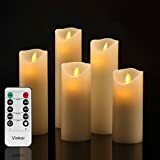 The Vinkor flameless candles with timer have two of the most sought-after features in flameless candles – remote control for convenience, and a timer for ease of use and efficiency. The flicker of the LED lights is almost entirely realistic, making them a beautiful addition to any party, dinner, celebration, or pub. They are powered by two AA batteries that are not included in the package. Candle impressions have been a favorite to many users since its inception. 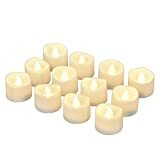 This set of five includes three 4” and two 6” candles, each with a diameter of 3”. Unlike all the models mentioned above, Candle Impressions has a very realistic wick. While all the others have flashing bulbs sticking at the top, this has wholly concealed the LED light bulb and instead features a cord. This wick is responsible for the one of a realistic king flicker that is found in none of the discussed models. Generally, the candle impressions flameless candle last up to almost 10 times longer than its competition. This is possible as it has a little power consumption rate. With two AA batteries, you will get more than 1000 hours of life out of them. In the rare event that something goes wrong, you are well covered by the 12-month warranty on the candle. Once installed, a simple flick of the switch brings the Antizer flameless candles with timer into life. Even when up close, these candles are practically impossible to distinguish from the real thing. The included remote control gives you almost complete control over the flame from a distance of around 16 feet. You can choose between a steady and a dancing light that casts shadows identical to those from a real candle. It also allows you to dictate the brightness of the flame. On top of that, you can set the timer of the candles to remain on for 2 – 8 hours (in two-hour increments). Of those above, Antizer best outdoor flameless candles has the largest diameter, measuring 3.25 inches, adding more than just light into your home. With this, you can get all the realism and ambiance of a traditional candle without any of the associated drawbacks such as the risk of burns. The eLander LED Tea Lights are the perfect way to create some ambiance and even, to some extent, boost the romance in your home. The eLander LED flameless candles with timer are white, so they can fit in whatever room you place them in. Its auto timer feature is very convenient and allows you to go about your business while the candles come on and off at the set time. Thanks to its minimal battery consumption, it can provide light for an average of 6 hours. With everyday use, it can live through a cycle of up to 12 days on one piece of CR2032 batteries. eLander LED Tea Lights can fit in any candle holder, furthering its convenience. These tea lights look amazing when added to the lining of your window sills, or a wall sconce. If you want to get creative with your décor, the small size of the CelebrationLight Flameless Candles allows them to custom fit in a glass. The remote control that comes in the package lets you control the candles from a distance of up to 20 feet away. You can use it to change between the three lighting modes that include flickering, gradient, and constant mode, or adjust the brightness. When you use the default 6-hour on cycle, a single CR2450 battery can last you over a month. This low battery consumption is because of the enhanced efficiency of the circuits board, low energy LED bulbs, and the high capacity of the batteries used. However, you can set the timer to 2, 4, 6, or 8 hours. The CelebrationLight Flameless Candles can be used for both indoor and outdoor lighting. As such, they are ideal for decorating restaurants, weddings, festivals, birthday parties, and thanksgiving among others. The package consists of the set of candles, a remote control, and one user manual. The package arrives containing 9 flameless candles, a remote control, and a brief user manual, but lacks the 2AA batteries required to run it. Comenzar Flameless Candles can run for up to 150 hours if used continuously as it is designed to save on energy. The batteries are installed underneath the candles. The remote control featured allows you to control all of the candles at once or a single one. Just point the remote towards the candle that you want to control and press the button. The Comenzar is highly responsive from a distance of up to 20 feet. You can also use it to set the timer to 2, 4, 6, or 8, hours, after which it shuts off automatically. All of that best flameless candles in the set are ivory in color and have a diameter of 2.2”, and lengths of 4, 5, 6, 7, 8, 9 inches. As it is flameless, you don’t have to worry about safety. You can use it for birthdays, home decorations, hotels, bars, holidays, weddings, or other occasions. 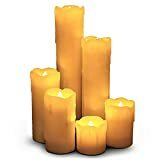 These Comenzar candles are the best flameless candles with the timer set 2019. The main reason as to why the Festival Delights Flameless Candles is our top pick of the best flameless candles is its build, and realistic flicker. It not only looks good but also functions just as much. It comes with the IC-controlled soft flickering, that makes the flame glow identical to real candles. Though it falls on the smaller side of flameless candles, it packs quite a punch in its small profile. 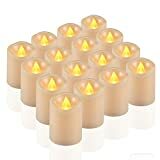 The Festival Delights Flameless Candles comes with 6 CR2450 batteries for each unit. More interestingly, it features 6 more batteries when the first lot gets drained. The enhanced timer on the unit ensures the candles to follow the time set accurately. On default, they light up for about five hours, and turn off for 19, continuing with the cycle daily. The candles are unscented and come with a one year warranty. To get the most out of your unit, you can use them together with your floral centerpieces. Not all flameless candles give that candle-like feeling. As such, picking the best one is very important. Our top pick, Festival Delights Flameless Candles with Timer comes with many features that make it exceptionally convenient. The remote control simplifies operation from a distance and the 6 pairs of batteries that are included in the package work for a very long time. Not only is it a tool for lighting, but it also makes a great decorating object.